By continuously detecting a maximum of 4 points, nested images in both X and Y axis can be cut aligning each image automatically. Selectable clamp pressure with high and low setting ensures accurate cutting of various media. Selectable three jog speeds ensure proper and easy positioning of the head to the point. Over-cut function makes the starting and ending points overlapped, which eliminates uncut portion of the media. Media can be loaded from back or front. Up to 6 roll media can be set at a time(1 set standard). Plug-in cutting software for CorelDRAW and Illustrator is included. A special adaptor to use commercially available pens and USB interface are included. 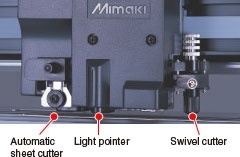 Click the button below to add the Mimaki CG-130FXII Cutting Plotter to your wish list.